he noticed a young woman ahead of him picking up starfish and flinging them into the sea. he asked her why she was doing this. The answer was that the stranded starfish would die if left until the the heat of the morning sun. 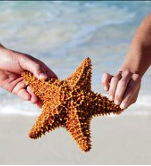 The young woman looked at the starfish in her hand and then threw it to safety in the waves.